History usually reveals a FOOSH mechanism. Examination reveals tenderness and usually swelling, deformity and impaired wrist range of motion. 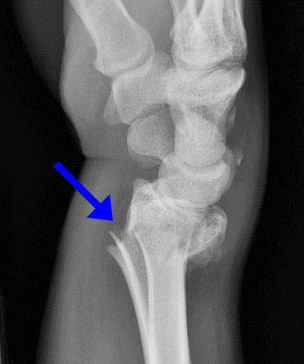 The overlying skin must be carefully examined for an open fracture. Check for palmar paresthesias from tension or pressure on the median nerve. There may also be signs and symptoms of acute carpal tunnel syndrome. The neurovascular exam must be performed before and after any reduction procedures.